Capo started out with a 12-0 run on day one. All 5 qualifiers–Brandon Hernandez, Mike Davis, Geoff Mellor, Corey Shackelford, and Phillip O’shea–made it to the quarterfinals in their respective weights. The streak was only stopped by running into a few #1 seeds. All wrestlers made it to day 2, with Brandon, Mike, and Phillip in the semi-finals, and Corey and Geoff in the consols. One particular story is that Mike, in order to get to the semis, had to upset the #4 seed from Arroyo. He did so in dramatic fashion, winning by fall in the third period. Day 2–aka “the day of dreams and broken hearts”–was full of drama. Geoff and Corey dropped hard fought consol matches in the morning–Corey in round 3 and Geoff in the blood round–eliminating them from the tournament. Both wrestled well, and the other guy was just better on that particular day. Mike dropped his semi match to #1 seed and #1 in the nation Zahid Valencia from St. John Bosco, but rebounded nicely with a win in the consols to put him in the third place match. 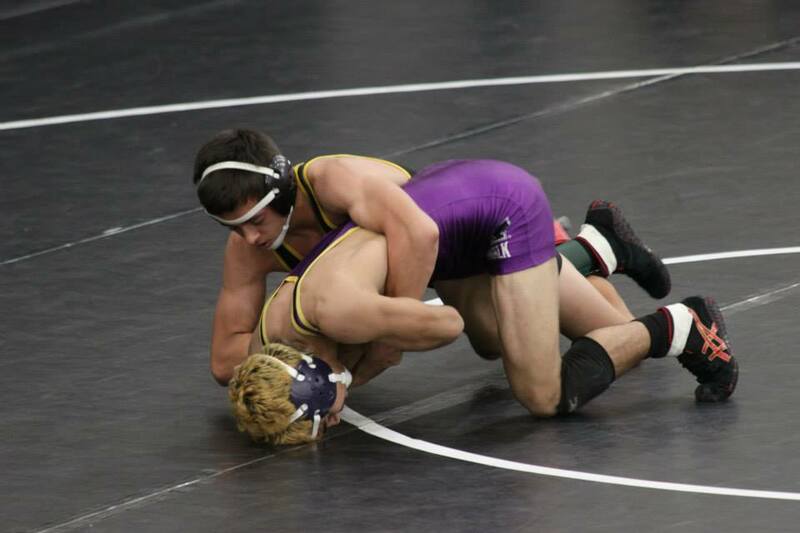 In the match for third, he lost to the #2 seed from Norwalk, placing him at 4th. Brandon continued to dominate by winning his semi match 12-0. In the finals, though he lost, he gave #1 seed Russell Rohlfing of Sonora all he could handle. Rohlfing will definitely remember Brandon’s name. Phillip won by fall in his semi match, and then stunned the whole gym by pinning his opponent in the finals in :11 seconds. He had 4 falls and 1 tech fall for the tournament, and he was named Co-Outstanding Wrestler for the upper weights. Phillip’s title is the first CIF Championship for Capo in 6 years. The last one was Mike Maierhofer in 2009. Here is a video of Phillip’s finals match: don’t blink! Senior Geoff Mellor finished his career as a Capo wrestler on Saturday. Geoff: we are so proud of you. 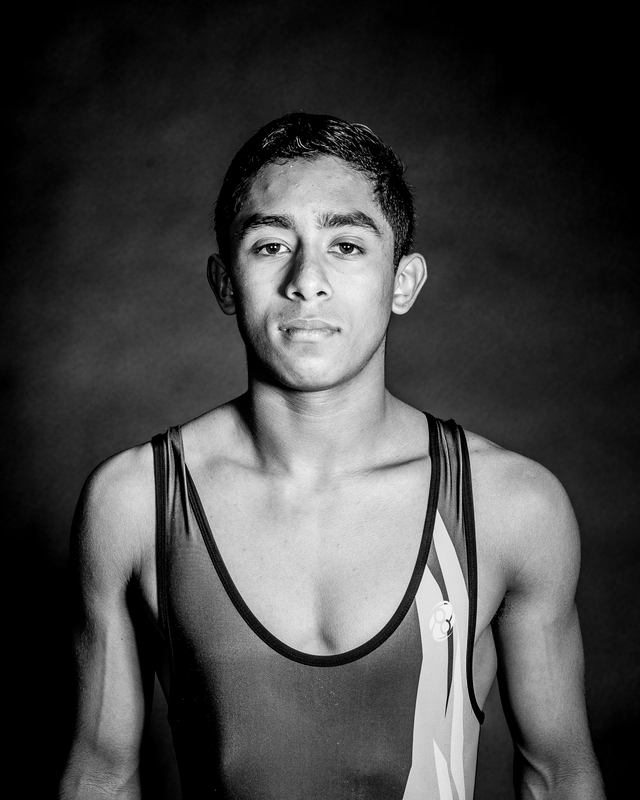 You have grown to become a good young man in your 4 years on this team, and we are glad to say you are a Capo wrestler. Through numerous ups and downs, setbacks and triumphs, you have persevered over it all and have finished your race. You controlled your emotions and did not allow them to defeat you. That is one heckuva feat, as this sport can be on huge emotional roller coaster. Now that you have crossed the line triumphant, you can now say you are part of the greatest fraternity of brothers on planet earth. We can’t wait to see what the future holds for you. It’s been an absolute pleasure coaching you and being your teammate. Don’t be a stranger, my friend. As a team, Capo finished 10th out of 50 teams. Next up for Mikey, Brandon, and Phillip is Southern Section Masters in Ontario. This is quite the party, as over 250 schools are represented in the Southern Section. They will battle it out with the other qualifiers for a spot in the state tournament. Top 9 qualify. Wish them luck! 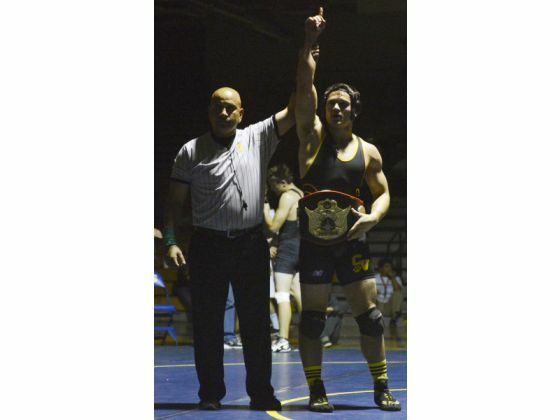 A HUGE congrats goes out to senior Phillip O’shea for dominating the “5 Counties” tournament over the weekend. Phillip finished in first, with 4 falls and one decision. 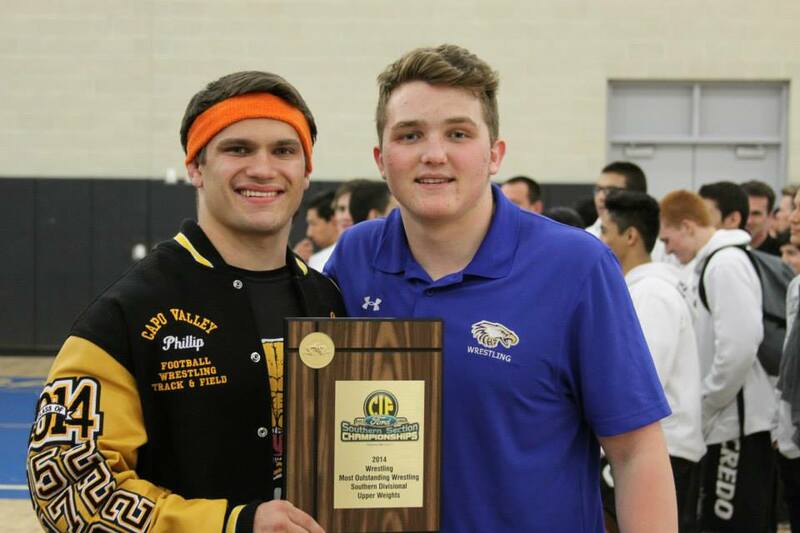 After a 4-3 semi-finals upset over Villa Park’s Josh Rus (who defeated O’shea last year at Master’s), Phillip ended with a bang by securing a second period pin in the finals over Damien’s Ian Gust. A little background about “5 Counties:” it is known as one of the toughest tournaments in the state, if not the nation. This year there were 94 teams present, 860 wrestlers total. 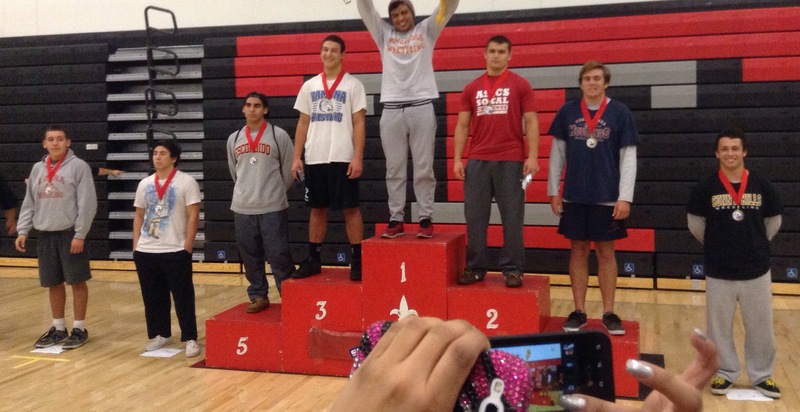 Many wrestlers from outside the OC came to battle…there were even some out-of-state teams. 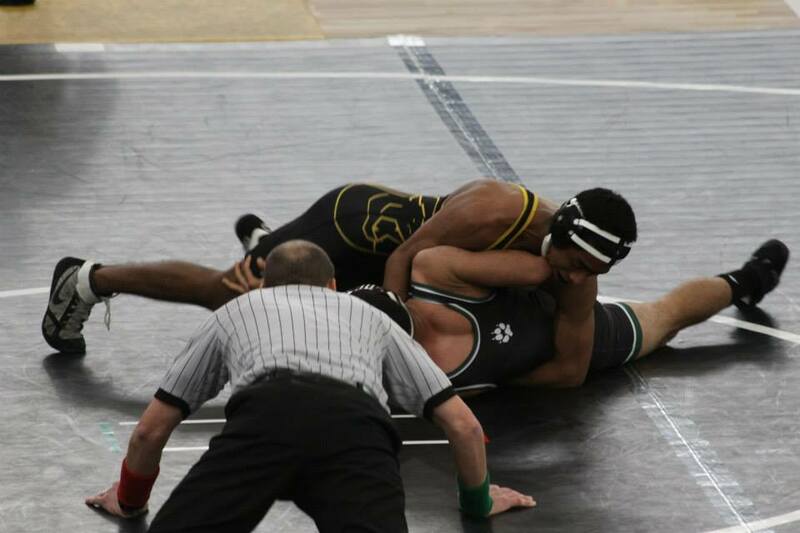 While Phillip dropped a tough 3-1 decision in the finals, this is not the last time he’ll face the Woodbridge wrestler. He will have a chance for revenge, and knowing Phillip, this will focus him and he’ll come back firing on all 8 cylinders. Geoff Mellor and Corey Shackelford both performed well too, making it to the “blood round” before dropping. 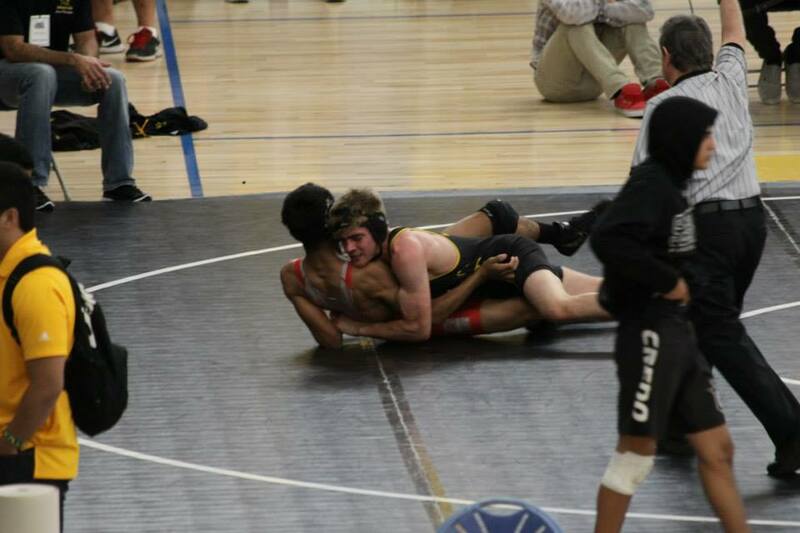 Along the way, Geoff defeated the ultimate 3rd place finisher from Trabuco Hills. A few jv wrestlers got some good experience. Even in the losses, we are seeing improvement and guys are taking steps forward. We are back in action tonight vs Laguna Hills, #2 in Orange County. Phillip has the chance to edge closer to Mike Phillips’ career pin record, which has stood since 1988. Saturday a select squad of varsity wrestlers will compete at Esperanza, while the jv and fs teams are at the San Clemente Rotary tournament. The varsity and JV competed in the Trabuco Duals Fri and Sat Dec 6-7. 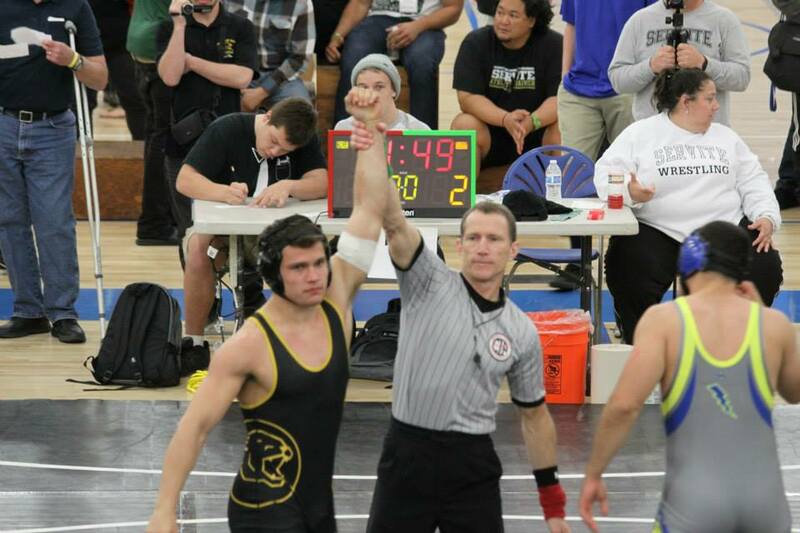 Brandon Hernandez and Phillip O’shea went undefeated on the weekend, 7-0. O’shea won all his matches by fall, 6 of which were in the first period. 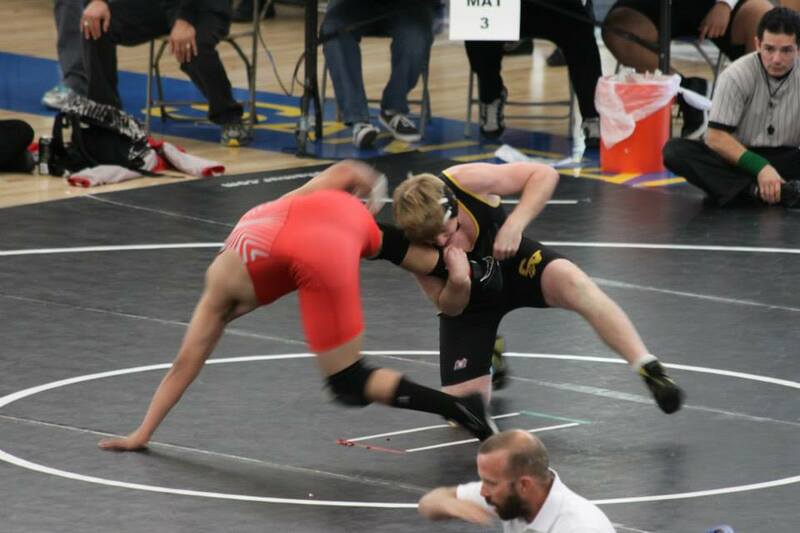 This included setting a new school fastest fall record with a 7 second pin vs El Toro. 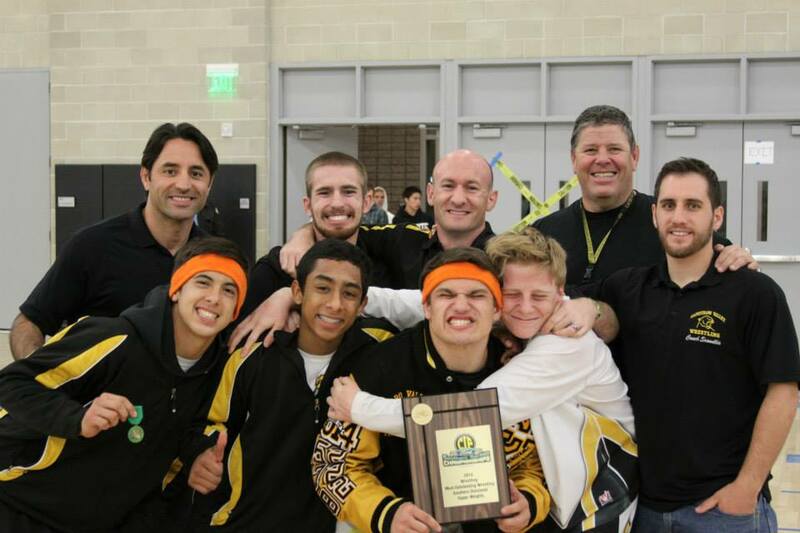 The FS team, meanwhile, spent Saturday at the Western Duals tournament. They finished in second place overall, falling in the final dual by a narrow 30-32 margin. 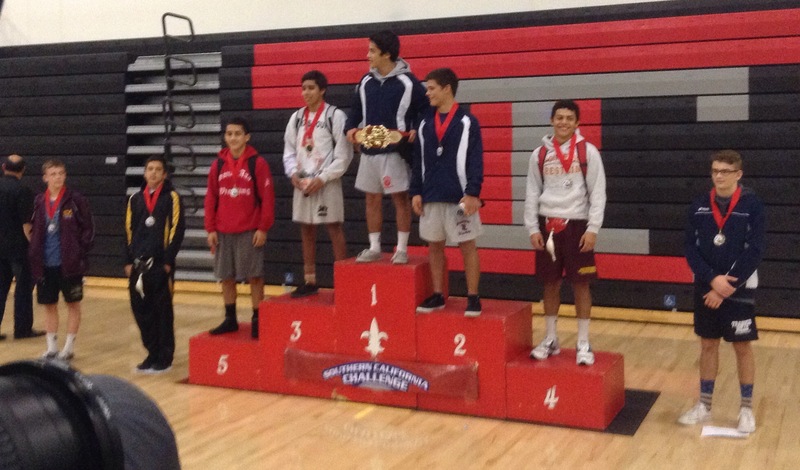 Several Capo wrestlers came in first or second place. The next dual was vs Dana Hills on Tuesday Dec 10. Capo fought hard and had an 8 point lead going into their two open weights (220 and hwt), but fell 28-32 after the 2 upper weight forfeits. Landon Hume avenged an earlier loss, and Noah Husband got an exciting pin at 106. Corey Shackelford won a battle in quadruple overtime. 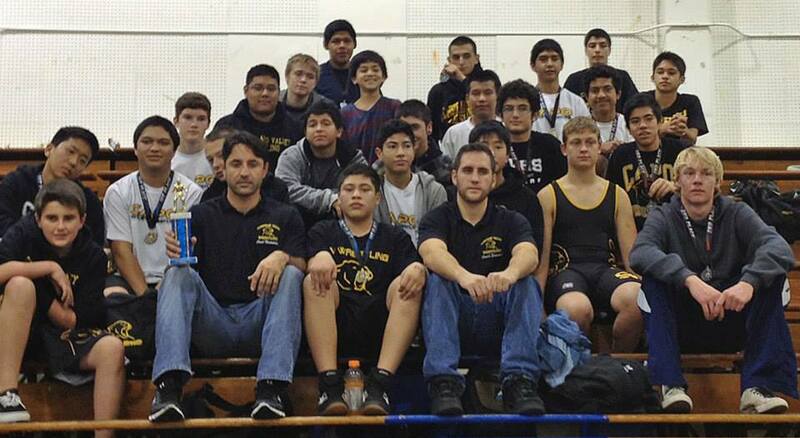 Thursday Dec 12 the novice team competed in San Clemente’s 4-way dual meet, and came home with first place. 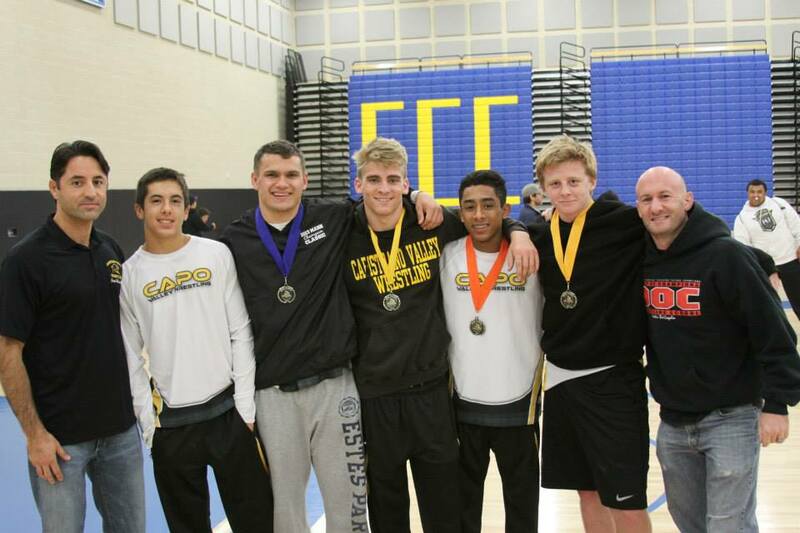 Six Capo wrestlers won first place. 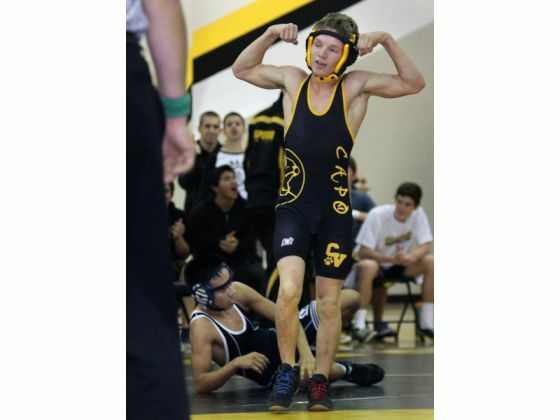 Saturday Dec 14 was Capo’s own jv and fs tournament. 20 jv and 20 fs teams–a very competitive field with teams like Laguna Hills, Poway, Vista, and Santa Ana–came to Capo to duke it out. Juan Pedraza finished in first place, while Juan De La Torre, Marshall Ferraro, Michael Souri, and AJ Martinez finished in third place. Things are looking up. This week we dual Newport Harbor at home, and the varsity will compete at the prestigious Mann Classic Friday and Saturday.